I one-clicked both books on NetGalley when I saw it. The cover arts captured my eye and their respective blurbs sound interesting to me so I one-clicked these babies and off to lala land I went for a couple of hours. Now I thought A REAPER OF STONE and REND THE DARK are part of one series, I didn't realize that these are the first books of two separate series of the same name. Both are also under a 100 pages, great palate cleansers or taste tests before we decide if we're commiting to the series or not. 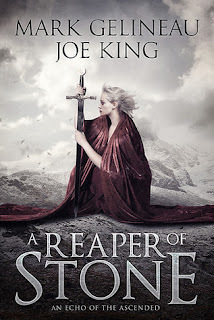 A REAPER OF STONE: I like Elinor, she's some sort of an Enforcer for the King and a loyal one at that. Elinor is a great soldier, quick on her feet, good strategist, and fought for the underdog here. Though the world wasn't explored much, I did like what I glimpsed at. The magic feels old, powerful, curious. But as this is such a short novel, the story is episodic, very straightforward, but it wasn't lacking in any way. A complete and satisfying short read. I can't say what the series arc is though, it just feels like Elinor is going to these towns, ensuring that the King's orders are executed and her monarch's will is done. 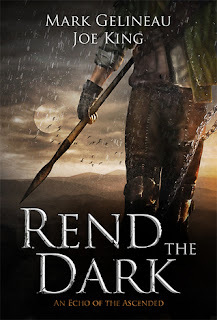 REND THE DARK: I like that the lead is a man, Ferran, the tone is definitely different from Elinor's story, it's brawnier, prophetic, even apocalyptic, but it's not as interesting as Elinor's tale. I liked the story, I like the idea of Titans and Ferran essentially absorbing the powers of his kills. I felt like the story wasn't as probed or developed as A REAPER OF STONE, maybe if there were a couple more chapters in, I would've been invested in the story. I saw these on GR giveaways, cool! Oh man, isn't it disappointing when you figure out that what you requested on Netgalley is part of a series you haven't read? Elinor sounds like a great character and I love the sound of the magic! Rend the Dark definitely sounds like a great darker fantasy. Wow, those covers are really beautiful and catchy, especially "Rend the dark" ! I'd be up to reading both of them if I just had the covers to go by. Rend The Dark looks like one that I would read for sure. It looks like it promises a dark world. Great reviews! I hadn't heard of these, but they have great covers! It is weird that they are called the same series but are different. I assume it's just all based on the world. Glad you enjoyed! This sounds like a fun series, thanks for putting it on my radar. Interesting that they aren't part of the same series, I am curious as to whether you will continue both or just one. Love the covers and they do sound good. Howdy everybody! I'm Mark, one of the authors of the books. First a huge thank you to talksupeblog for the reviews! We are really honored by the attention and interest the books are getting here. In terms of the series structure, Echoes of the Ascended is a collection of series, all taking place in the same world. The first series within the Echoes of the Ascended is the A Reaper of Stone series, which starts with book 1 of the same name, and book 2, which comes out on February 15th, is called Broken Banners. In case you like the world of Aedaron, the first stories in the other two series are out as well. Best Left in the Shadows is a fantasy crime noir story and Faith and Moonlight is a YA sword school tale. Feel free to check us out at www.gelineauandking.com. We'd love to hear from you. And again, much thanks to Talk Supe for the reviews. That whole series name thing was confusing me big time. Glad one of the authors stopped by the comments. :P I'm glad you enjoyed these Braine!! Great quickie reviews on these novellas! What a nice surprise that these were the first books in their respective series. Gorgeous covers and new to me. I can see why the covers grabbed your attention. Oops, about the separate series, but glad that worked out to give you a taste of both.